OnePlus will officially reveal the OnePlus 5 on June 20th, but it looks like the company just couldn’t wait that long to show off the design of its next flagship smartphone. A commercial airing in India has shown the OnePlus 5 design two days before the phone’s announcement. In the ad, we can see the entirety of the phone’s front and back, complete with a dual rear camera setup, OnePlus branding, and fingerprint reader below the display. What this commercial doesn’t shed any light on is the OnePlus 5’s spec list. OnePlus has confirmed that its next flagship will include a Snapdragon 835 processor, but other than that, the OP5’s feature set is a mystery. The OnePlus 5 has a few small design changes from the OnePlus 3/3T, but the one big change is its dual rear camera setup, which looks like it’ll be a major focus in OnePlus’s marketing of the phone. 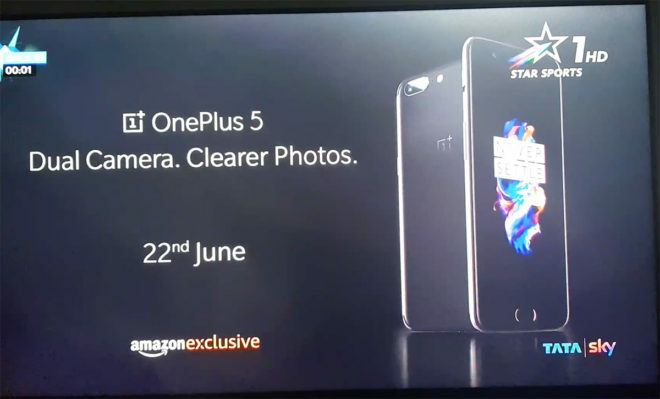 Because of that, it’ll be interesting to see what features OnePlus has cooked up for the OP5’s dual rear cameras and how well they perform. Looks like a cool phone but if it’s not available through US carriers (specifically tmo) it just won’t matter for me. Jump program is too good to leave it. It’s not necessary to tie yourself from US carriers’ contracts nowadays.No matter to you if you’re the rich. There are no contracts, he just wants to use the upgrade program instead of paying full price. It’s not about tying your self to a carrier love.. Phones that come directly from the carrier tend to work a bit better.. Not only are they configured by the carrier to work better with there network(T-Mobile), they also can be troubled shoot if you have a problem with them.. That’s just from my experience..
Nice phone, but i’ll hold off till 5T. My OnePlus 3 with a zero lemon battery case is outperforming many devices available today. I won’t be buying one of these phones :(.. Even if they had the top male actor in the United States in their commercial. Being persuaded to purchase shiny bobbles because someone famous tells me so… Isn’t going to work with me. Besides, I just purchased the Alcatel GoFlip phone for $75 bucks… im very satisfied with that, No Bloatware, Wifi Mobile Hotspot, and Wifi Calling, FM Radio…. And Im very tired of spending so much money on these smartphones . So it’s an iPhone 7? Literally look at it. It’s the fame fking design.